I love these two emotion apps for my special education students, and you can't beat free! 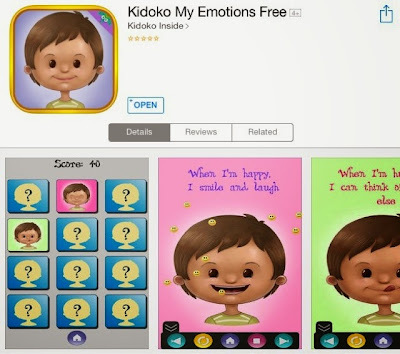 Kidoko My Emotions is an interactive book with a cartoon boy face displaying a variety of emotions and explaining why/when he feels that way. There is also a matching memory game that my students enjoy. Definitely geared towards younger students but it's not too babyish, and it's perfect for my student's emotional level. There is no ads or in-app purchases which is SO nice! Also available on Google Play for those of you who have Androids! 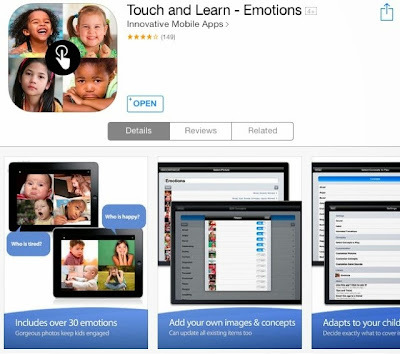 Touch and Learn Emotions is a simple app to use. It shows 4 pictures on the screen at a time (picture range from babies to adults - appropriate for all ages) and asks the user to choose the appropriate emotion. This app is also highly customizable. You can choose what emotions to display, whether or not to display text, what noises to play (correct/incorrect sounds), and you can even add your own pictures! Do you have any other favorite emotions apps? I have more downloaded on my iPad but these are the two that my students and I keep going back too.